WHAT: This one-step wonder creme for healthy, fine and even oil-prone hair fights frizz, protects against heat damage, and has (invisible) microfine oil-absorbing powders to extend the life of your blow dry right from the start. WHO: For healthy hair, even fine or oil-prone. WHEN: On clean, damp hair before blow-drying. HOW: Work evenly through damp hair. Blow-dry, section by section, until dry using a flat brush for sleek looks or a round brush for more movement and bend. For pin-straight styles, finish with a flat iron. WHAT: This serum-in-creme elixir for dry or damaged hair helps seal split ends and protects against heat, breakage and UV damage, too. 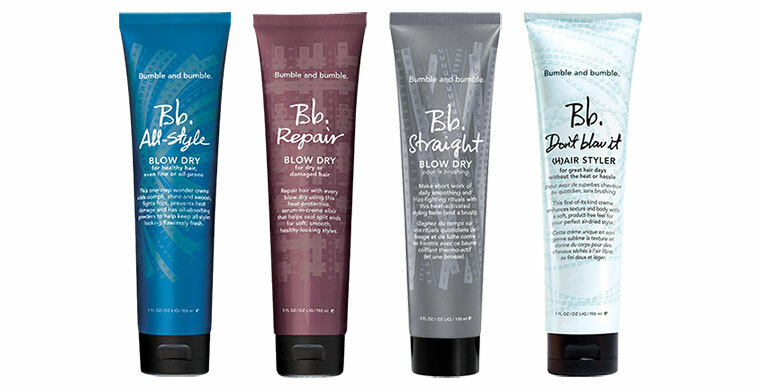 Proven to help repair hair with every blow dry and keep styles looking soft, smooth and healthy for up to 3 days. WHO: Dry or damaged hair that needs tender loving care. WHAT: This heat-protective styling balm makes short work of smoothing and straightening, and keeps styles sleek, smooth and frizzless for up to 3 days. HOW: To style it straight, work evenly through damp hair and blow-dry, section by section until dry using a flat brush for sleek looks, a round brush for more movement and bend. For pin straight styles, finish with a flat iron. WHAT: A first-of-its kind creme to give you an air-dried look with a product-free feel. WHO: Polymers and plant-based conditioners enhance texture and body. The blend provides a lightweight, touchable finish. UVA and UVB filters protect against the damaging effects of the sun.